Rolling gates are primarily used for chain link fences in order to minimize the amount of space used by the gate. These gates slide parallel with the fence line using a track and wheel system. Gate frames are welded and depending on the size may also be braced and trussed. Finish size of gate must be wider than the opening size to account for the rear wheels which are bolted to the gate frame. Gates do not require a wide counterbalance like a cantilever gate. The height of the gate is shorter than the fence to allow for the chosen wheel carrier which is under the gate. Rolling gates use less space than typical swing type gates. They are also inexpensive compared with V-track gates and cantilever gates. The design is simple and incorporates many fittings that simply bolt together making the project possible for a do-it-yourselfer. The lack of a counterbalance on the gate frame makes tight fits possible. Repairs and adjustments are easily done with household tools. The wheel carriers which are mounted under the gate prevent the gate from being installed close to the ground. Although few animals can squeeze through a 3-6" gap, it can still be problematic. Wheel carriers are also susceptible to being blocked by snow and debris. 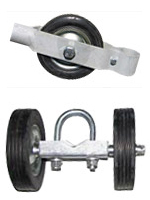 Wheel carriers work best on asphalt or concrete driveways. You may also consider pouring a sidewalk-like path in concrete for the gate wheel(s) to travel on. Wheels mounted on heavy gates will wear into asphalt driveways and dig a rut. Rolling gates work best on level surfaces. Rolling gates CANNOT be automated. The friction of the wheels will destroy an operator. If you either now or later wish to automate a sliding gate, consider using a cantilever gate instead. 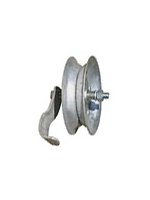 Function: The function of the wheel carriers, single or double, is to hold up the weight of the latch side of the gate. They also keep the gate lined up with the latch post. Most simply bolt on, however consider tack welding part of the fitting to better secure the fitting. Choosing a Size and Type: There are many factors and variables used to determine which size and type of carriers to use. Weight, size, and terrain will all play a role in choosing a wheel carrier. When in doubt, choose the heavier model. Function: The function of the rear wheel is twofold; it both holds the rear of the gate off the ground and keeps the gate on the track at the same time. Rear wheels bolt to the upright of the gate frame using rear wheel brackets. There is a small steel plate mounted to the rear wheel which holds the gate on the track. All rear wheels will roll on a 1-5/8" track which is a typical size of tubing used for top rail, mid rail, and bottom rail. Function: Pipe track brackets are used to mount the track to the posts. 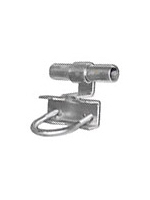 They are available in different sizes and shapes for different mounting applications. They are cast in such a way that allows you to connect 1-5/8" track on each end to continue the track to infinity. The same part is used to terminate the track; simply cut off the swedged piece for a trimmed look. 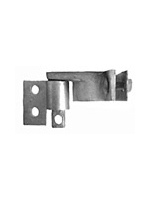 Function: As with most latches, rolling gate latches are used to secure and lock a fenced in area or driveway. These are also available in a few different styles.